Right then, with Salute almost upon us it's time for an update regarding Blitzkrieg Commander and it's both good and bad news. The revision group have spent the past 3 months going through a 60-page document containing all of the issues and feedback we received when BKC-III launched. For each problem they've examined and playtested to come up with a recommended fix, but unfortunately in most cases the advised resolution was to revert to BKC2 instead. The overall concensus was that BKC2 was a better ruleset, more historically accurate and most importantly, more fun to play. Now we could attempt to pull out sections of BKC-III and replace them with BKC2 but this would result in a potentially messy mashup of the two sets with a lot of clashes and no real flow. This is too much of a risk to take at this point. So, the end result, and the bad news, is that BKC-III is dead. We don't want to take a gamble on something which might not be up to standard a second time, so we think it's better now to draw a line under BKC-III and move on. I know a lot of people have had this same conclusion over the past 12 months but we had to make sure for ourselves before reaching this decision. And so we move on to the good news. We've spoken to the group and they're happy to work with us to create BKC-IV. 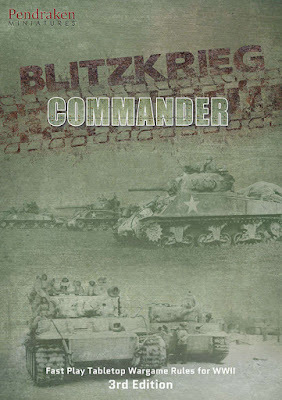 This will be a proper evolution of Blitzkrieg Commander, done by a group of players with over 10 years of experience with the Commander series of rules. There won't be the same level of changes that we attempted with BKC-III, instead this will be more of a gentle progression to tidy up and clarify whilst retaining the identity of the original rules. Now we are extremely aware of how long this whole process has taken and we apologise to everyone that has been sat waiting for nearly a year now. The playtest group have advised us that a 3-6 month timescale is definitely achievable to have a new BKC sorted out and ready to print, so we're looking at the end of September as a deadline. For everyone who bought a copy of BKC-III, nothing has changed as regards our promise to you. Everyone who has BKC-III will automatically get a copy of BKC-IV, whether it's a physical book or a pdf. We'll also see what else we can do to thank you for your patience throughout this process. However, if anyone doesn't want to wait any further then we will refund your original purchase, no problem. No doubt there'll be some questions on this, so let us know and we'll get them answered as best we can. We're away at the Salute show from Friday to Sunday night, so we might not be able to reply to you until we're back. Also, we won't have any information on BKC-IV at this time, we'll need to give the revision group a little time to start formulating a plan for moving forward. We'll advise on that process as much as we can along the way. And finally, thanks to everyone for their understanding and patience with all of this. We take a huge amount of pride in our products, our service and our reputation and we're going to keep our word and make this right for everyone.